I got this idea from Design Sponge's feature on making your own old fashioned feather pen. I really did intend to do it completely the way indicated, but then I found myself in the dollar store face to face with a bag of multi-coloured feathers for a buck. 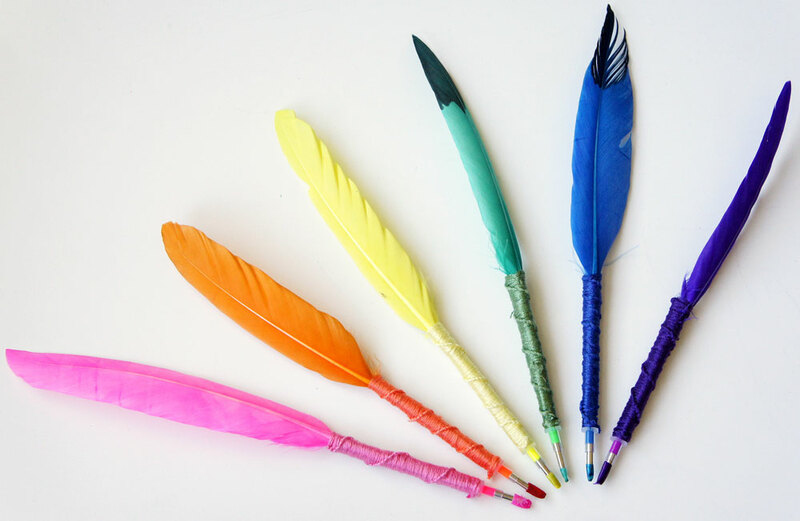 It kind of excited me because if I bought them, I wouldn't have to go about dying my own feather AND they were only a buck. For a whole bag! Then I scrounged around for pen refills. Unfortunately, I couldn't find any (you'd think a dollar store would have that), but I did find cute miniature gel pens for a buck. 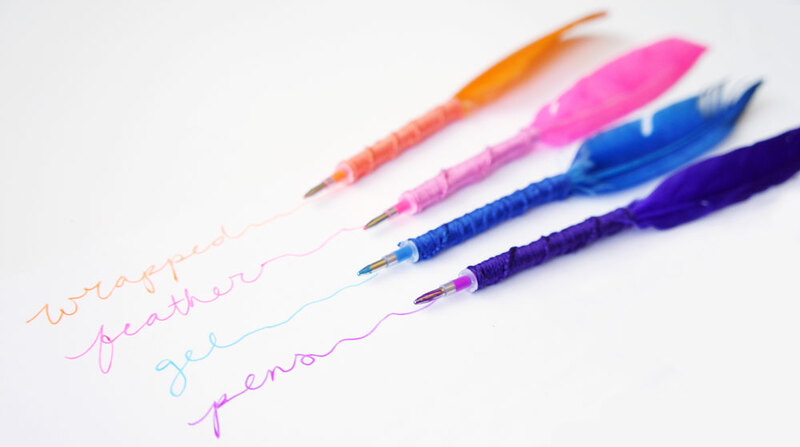 I thought my feather pen idea would be so much cuter if I used pens to match the feather and oh, the rainbow-y coloured cuteness that would ensue! 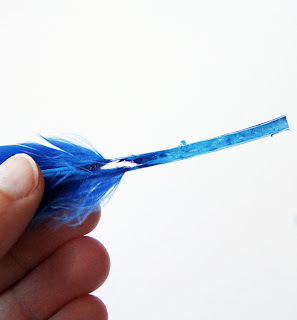 Until I got home, cut into my first feather, unscrewed my first gel pen and realized the feather was too small and the gel pen too thick. 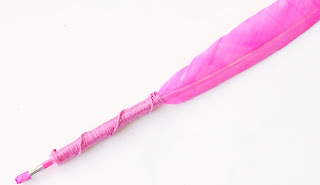 The pen wouldn't go into the feather as instructed in the original DIY. Bummer. At first, I was going to drive all over town looking for feathers to fit the gel pens and if I'd have to, I guess I could buy some proper pen refills. Until I had a little brain storm/dream revelation that night about wrapping them with some thread to keep the pen on. And hence was born the wrapped feather gel pen! There are a lot of feathers to choose from, so try to pick one with the thickest and longest quill (that's the long non-feathery part). Cut the tip off, then use a sharp blade to cut half of the quill away. 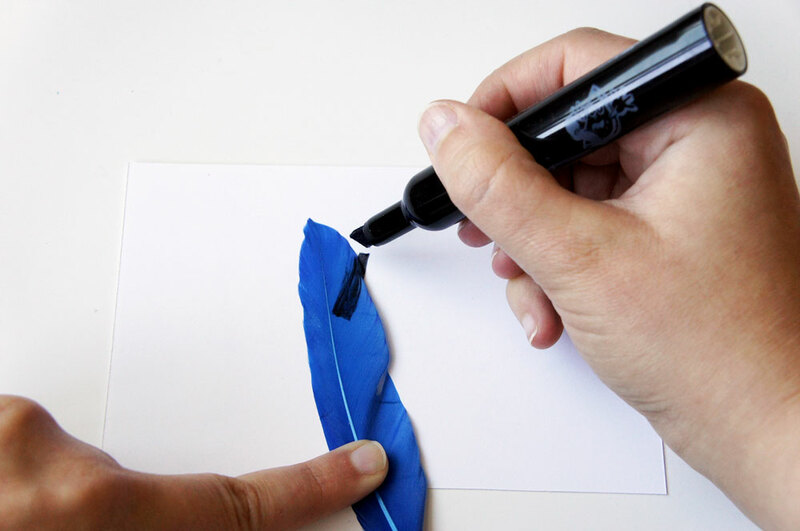 Basically, you want to cut enough out so the pen fits as flat to the feather as possible. It doesn't take very much force to cut it, but it's best to work at it incrementally. It'll hold up to some pretty good jabs, but it's still delicate. 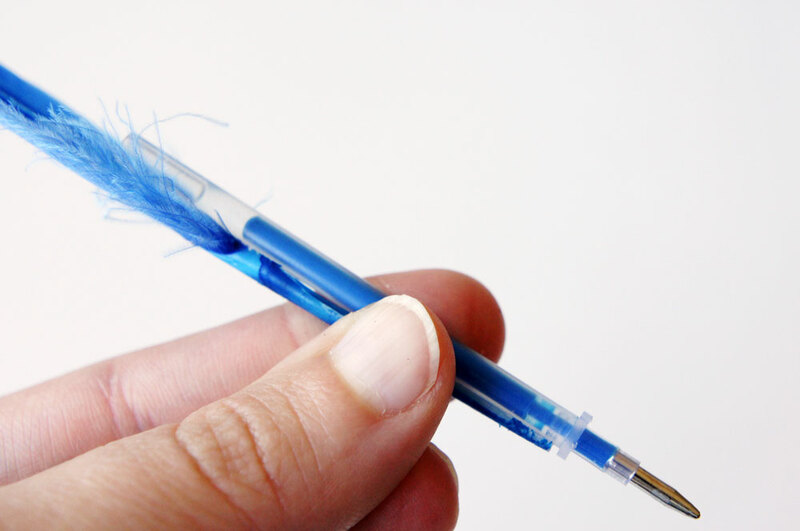 Keep referencing your pen to make sure you've cut enough. I also cut the end off my gel pens just above where the air bubble was to make them a little shorter. I used a binder clip to hold the two together while preparing and starting the string. Measure out a lot of embroidery thread. Maybe more than you think you need (it's better to have too much than too little). 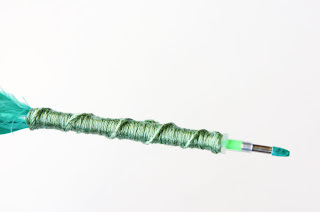 Tie a knot at the top of the pen and start knotting around the pen and feather with a basic friendship knot. This took me forever to photograph and then I realized it would be better with a video. Therefore, the knots on the blue pen aren't as tight as they should be, and you can't really see the swirl. But if you're not doing it in front of a camera very awkwardly (it's so hard to do something like that while looking through a camera screen, and if I didn't look in the screen, I'd end up moving the whole project off camera), the swirl will come pretty easily. 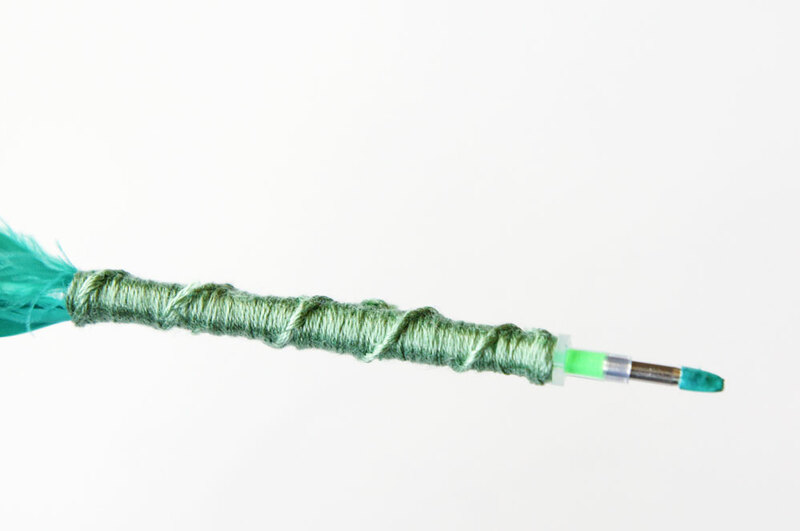 Just let the string move around the pen as you're knotting it and keep pushing it together tightly. If all goes accordingly, it should look like this. If you want fancy black tips, just grab a felt marker and put them on however you'd like. Just make sure to wipe off any excess and allow to dry before using. 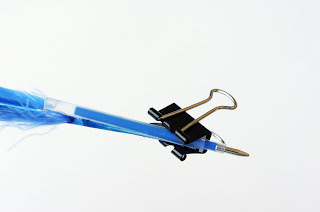 Finally, I capped the ends with a removed quill tip to keep the ink from getting all over everything (just find one out of your feathers that will stay on firmly. It doesn't have to be from the feather you used). Gel ink comes out onto everything really easily, trust me and my rainbow hands. That's it! It took me about 15 minutes to do one, so it's a really fast project and a nice little gift for yourself or someone else. I still prefer the sophisticated Design Sponge feather, but these have a fun playfulness that I really love, too, and they're a lot smaller so they'll fit perfectly into an envelope (which is exactly where mine are going). These are awesome! I'm so impressed. Lael: I can imagine they'd go over well with that crowd! Stephanie: I still haven't sent them in the mail! I may only send one now... they're too cute! I love these! I have a lot of feathers because I was making feather earrings recently so this is perfect. Sable would adore a set of these pens and I'm going to keep it in mind for her Christmas present. Thanks! these are amazing. what a great idea. i'll be following you now to see what other tricks you have up your sleeve! What a great find! Cheers! How can I get your video to work? Hi, just making the friendship knot will end up with the extra twirl you have on ur pens too? 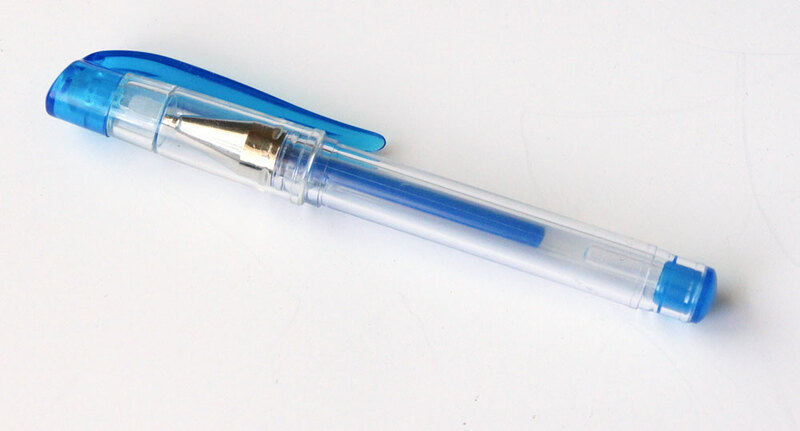 Your pens look like they have an extra twirl outside besides the wrapped part... Thanks! Anon: It works fine on my end. Just hit play! DottyDots: The knot will end up as the outside twirl. Just allow it to "travel" around as you're knotting it. I work in the teen department of a public library. We are using your idea for a teen craft program and I wondered if we might use some of your pictures or your video in our promotional stuff. We usually make detailed instructions for the kids, but yours are so good, it doesn't make sense to redo them. We will give you full credit for this great idea. Anne: That sounds awesome! Thanks for letting me know. 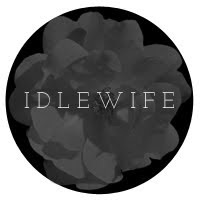 It would be awesome for me to see finished pictures, if it's not too much trouble (send them to: email.idle.wife [at] gmail.com)! Have fun with the tutorial! Thanks so much. We aren't doing the program until September, but I will get some photos to you. Your ideas are really creative. Thanks again.